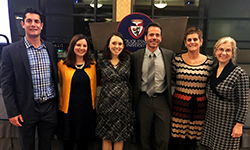 The Duquesne University School of Pharmacy Office of Experiential Education held a Preceptor Appreciation Event in the Charles J. Dougherty Ballroom on Nov. 20. Dr. Amy Woods, Assistant Director of Experiential Education, said the event was a way to thank the Duquesne University School of Pharmacy preceptors for their continued commitment, dedication, and support that they provide. Woods said that about 50 pharmacist preceptors were in attendance from a variety of practice areas including hospital, retail, long term care, managed care, ambulatory care and industry. Preceptors were able to network and connect with the staff Office of Experiential Education and the Assistant Deans of the School of Pharmacy during hors d'oeuvres and registration. Following the opening reception were presentations regarding the state of the school as well as experiential education updates. "The evening concluded with a continuing education program entitled, "Effective Precepting Techniques," led by one of our faculty members Dr. AJ Greco, to provide additional tools on how to foster the most valuable learning experiences possible for our student pharmacists," said Woods.